How much does it cost to travel to Lugo? How much money will you need in Lugo? €51 ($58) is the average daily price for traveling in Lugo. The average price of food for one day is €18 ($20). The average price of a hotel for a couple is €45 ($50). Additional pricing is in the table below. These average travel prices have been collected from other travelers to help you plan your own travel budget. Located in northwestern Spain, Lugo is a city of the Galicia region best known for its old city, completely surrounded by Roman walls. 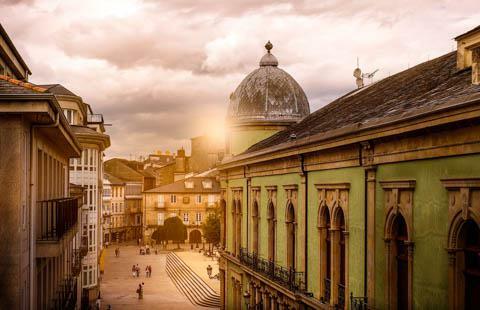 Within these walls are some of Lugo's most impressive sights including a striking city hall, elaborate cathedral, and many beautiful city squares and plazas. The city is also known for its festivals and is the capital of a province of the same name. Lugo is best known for being the only city in the world to have a circuit of completely intact Roman walls. Dating back to the 3rd century, the walls cover a length of about 2,117 meters ringed with 71 towers that can be accessed by multiple stairwells allowing visitors to walk the perimeter. They have been designated an UNESCO World Heritage Site. Just inside the walls is a picturesque square with another piece of antiquity with the Lugo Cathedral dedicated to Saint Mary. With the earliest part built in the 12th Century, the cathedral presents an eclectic mix of architectural styles that have been added over the years. Other important religious sites include the Church of St. Dominic and the Gothic-styled Convent and church of St. Francis which currently houses the Museo Provincial, showing a display of Galician art and other buildings of the 18th century. The Museo Interactivo de Historia de Lugo offers an interactive experience of the city"s history, while the Rosalia de Castro Park offers a little piece of greenery with a pond and many species of trees to provide a calm and quiet space in the midst of Lugo. Other notable sights include the Baroque-style City Hall with its clock tower, and a Roman bridge that stretches over the river Minho. The hub of Lugo is the old city, completely encircled by ancient Roman walls. Though it is compact, the streets here feel spacious and open probably due to the smaller scale of the buildings. The main square in the old city is called Praza Maior. It is located near one of the primary entrances through the wall, and sits at the base of the Lugo Cathedral. The plaza itself is beautifully paved and landscaped with a series of cafés and restaurants as well as a tourist office close by. There are a number of plazas and gardens just outside of the old city as well, one of which includes the Parque Rosalia de Castrooffering a little natural escape from the busyness of the city. Opportunities for shopping and dining can be found just about anywhere in and around the city center. Beyond exploring city sights and walking the famous Roman walls, some of the best activities of Lugo occur during its festivals. One such celebration is the Saint Froilan festivity, dedicated to the city's patron saint, which lasts from October 4th to the 12th. It is considered to be a Fiesta of National Tourist Interest, and includes the usual festivities of food, music, and fun. Arde Lucas is another well-known festival of Lugo which celebrates its Roman past, including a commemoration of the declaration of the city's Roman wall as a World Heritage Site in 2000. Cuisine found in Lugo will be pretty much the same as the fare served throughout Galicia. Being a world fishing power, the region brings in a large selection of fresh fish and seafood. The Spanish word for seafood is "marisco," and fresh catches include things like clams, mussels, pod razors, cockles, crabs, barnacles, crayfish, snails, lobster, squid, sea bass, hake, scorpion fish, anchovies, sardines, and tuna. Pulpo a feira is a common seafood dish of octopus prepared with oil, salt, and hot paprika. Then there are empanadaspies made with a traditional dough, filled with onion, pepper, and some meat, usually tuna, veal, or seafood. Another specialty of Galicia is a type of stew called Caldo Galego, which is simple but satisfying for warding off the damp chill of the region"s climate. There are many excellent dining options in and around the historic heart of Lugo. By plane, the nearest airport is Santiago de Compostela Airport located in Lavacolla. Flights are operatd by Adria Airways, Aer Lingus, Air Berlin, Air Europa, EasyJet, Iberia, Ryanair, Volotea, Vueling, and Turkish Airlines. By bus, the airport is about two hours away from Lugo (via Empresa Freire bus line). By train, RENFE has a train station in the city which connects Lugo by rail to the rest of Spain. There are daily overnight sleeper services to Madrid and Barcelona as well as regional services directly to A Coruna, Ourense, and Monforte de Lemos from which there are connections to every major town in the region. Lugo Bus Station, located just outside of the old city walls, provides operations by Empresa Freire (to/from Santiago), ASLA (destinations throughout Spain), and Arrive del Norte (destinations throughout Galicia).